With the support of the Eu-Russia Civil Society Forum Antigone and the Russian Ngo Man and Law developed the project “Rights in prison. EU-Russia Civil Society Forum and the defence of fundamental rights in the penitentiary system”. On 6-8 July 2016, a working meeting of the team took place in Rome, Italy. Apart from the project partners - Alessio Scandurra from the "Antigone" Association (Rome) and Irina Protasova from the NGO "Man and Law" (Yoshkar-Ola), the events gathered representatives of the civilian oversight commissions from the Republic of Mari-Eland the Tomsk Region and the "For Civil Rights" Committee (Russia) as well as NGOs "A Buon Diritto" and "Forum Droghe" (Italy), and others. On 6 July 2016, the Open Event "Civil Society in Russia and Italy. Share of Experiences and Cooperation Opportunities" was held. Later on an Italian delegation travelled to Russia, but this time not everything went as planned. The representatives of three Italian human rights organisations - Antigone, Arcigay and A Buon Diritto - that were visiting the offices of the Committee for the Prevention of Torture in Nizhny Novgorod were detained by police for 10 hours and each fined 2,000 roubles for allegedly violating migration rules before being released. After the release the Italian embassy recommended the member of the Italian delegation to travel back to Italy as soon as possible. The Optional Protocol to the UN Convention against Torture and other Cruel, Inhuman or Degrading Treatment or Punishment (OPCAT) was adopted by the UN General Assembly in 2002 and came into force in 2006. The OPCAT establishes a system of unannounced and unrestricted visits to all places where persons are deprived of their liberty by independent international and national monitoring bodies. When a State ratifies the OPCAT, its main obligation is to set up a National Preventive Mechanism (NPM) to undertake regular visits to places of detention. For the first time, an international treaty focuses on national implementation and provides a national body with specific powers to prevent torture and ill-treatment. NPMs are mandated to conduct regular visit to all types of places where persons are deprived of liberty. These visits should lead to reports and concrete recommendations to improve the protection of persons deprived of liberty. NPMs can also make comments on laws and regulations and propose reforms. Every year, NPMs have to publish an annual report on their activities and torture prevention issues in their country. 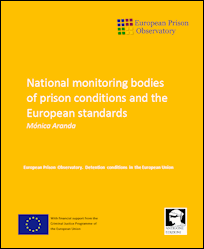 Reducing the prison population in Europe: Do community based sentences work?